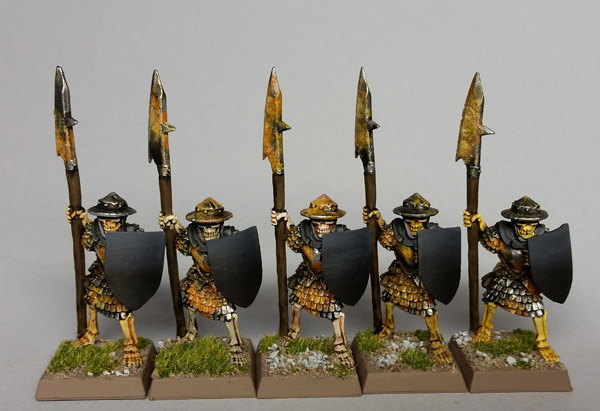 Next up for Deadcember's paint-a-thon (December is shaping up to involve more painting than the entire rest of the year at this pace) is a group of five skeletons that I believe are old Citadel. I'm not sure, I got them as part of a trade. They are bigger than the Nightmare Legion, but they will probably end up as filling in odd units either in the Legion or elsewhere, as needed. They're really nice sculpts, I wish I had more that were similar to this. I've had no luck in finding old metal skeletons, though -- other than these, obviously. Shields are Empire heaters with the tiny hole filled in & sanded smooth. Very nice, could they be from Maurader Miniatures? Excellent work, very nicely done. Got a few of these babies and they are old Citadel Mimi's. loving the rust on those guys.